The eMotion and eCognition Lab is focused on the interactions of humans and technology, and the ways that technology can be harnessed to improve the human experience. 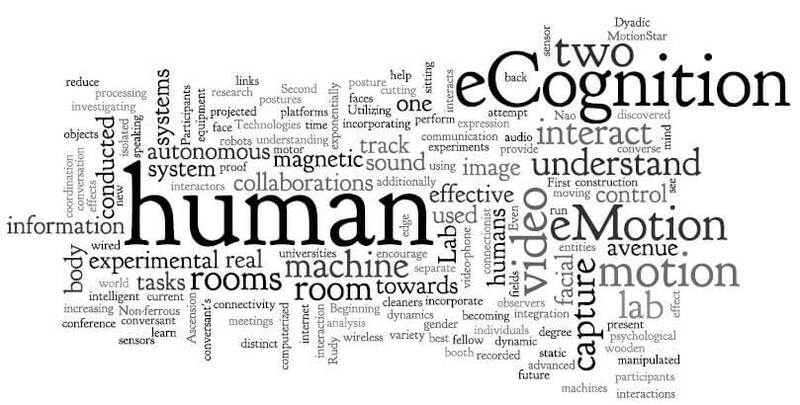 The eMotion and eCognition lab uses technology to investigate a spectrum of psychological phenomena ranging from the use of motion capture to study the basic mechanisms underlying human movement and imitation (eMotion) to the deployment of robots and avatars a means to study the ways in which humans interact with and are influenced by artificial entities (eCognition). The little e in each part of the lab title signifies that an overarching theme of the lab is the influence of technology, both as a tool for implementing our research methods as well as a subject to be studied in its own right. Societal and ethical impacts of various modern technologies such as humanoid robots, virtual worlds and electronically-mediated communication are informed through experimental studies and the collection and analysis of physiological and behavioral measures. The image below is a "word cloud" based on the text on this site. In this cloud, different words are given greater prominence based on how frequently they occur in this text. This cloud is an interesting visual representation of how we describe the lab. is the abbreviated version of our lab name. It also sounds like some kind of weird entity. So we wondered, "what might an eMoteCog look like?" Here is our best guess (courtesy of Dr. Michael Mangini).